The Middlesex League team notched up another fine win last night with a dominant display against Harrow. Despite being our biggest rivals in the league on paper, Harrow have been struggling to match their home strength at their away fixtures. Last night was no exception – the visitors brought just six players, with only four graded 100+. Sheikh’s game on board five was the first to finish. His opponent lost a Queen early on, picking up just two Knights in compensation. Black pieces continued to drop, and the inevitable resignation could probably have come several moves earlier. Sheikh now has three wins from three in the league. Paul, playing on board two, finished second. With the Black pieces and a grade advantage of just six, he was more than content to take a draw in a very equal looking position to leave the team needing just one more point. New member Marios became the team’s 24th player to play this season. His very young opponent was not able to provide much competition at the board: Mario’s superiority in all departments meant the game was over almost before it started, and Hammersmith had hit the magic 4.5 mark. 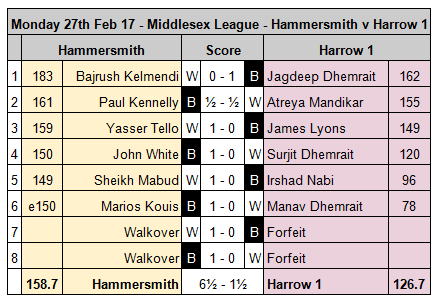 Bajrush’s game was not one for the Hammersmith books. A strong opening left him with two passed-pawns that he should have converted into a win. All it took was one oversight, however, and suddenly he had lost a Bishop and pawn. Despite the blunder, his opponent was left with very weak light squares and two uncoordinated Knights. To his credit he defended resolutely, organizing his pieces at the correct moment and before long it was all over for Bajrush. Yasser’s game on board three opened up very early. Soon both players had pawns on the seventh rank and Black’s King came marching up the board. After some tactical manoeuvres from both players, it was Yasser who came out a pawn up and converted the advantage without a hitch. Yasser also moves to 3/3 for the season. Despite John spending more time watching Yasser’s game than his own, he played some good chess, establishing an early passed-pawn and a strong hold on the centre of the board. Swapping off most of the pieces he started to push his passed pawn and force White’s King from behind it. It could have been more difficult had his opponent spotted a tactic to gather the pawn, entering a tricky RPP v RP endgame. In winning the game, John becomes the third player now sitting on 3/3. All-in-all, a pretty convincing win that puts us further in front of the chasing pack. Five matches remain, including a grudge match next Monday against Muswell Hill 2, the only team to have beaten us this season.